They are just about to release their debut album and are launching a UK tour already: that’s what I could call ambitious – or clever. UK band Gin Annie (based in Wolverhampton) are definitely going for it, having taken a challenge already by choosing a genre that is very well populated and hard to make an entrance into: melodic rock. For newcomers, they are doing really well. The album doesn’t stand out as a masterpiece; however, it is a very decent release. All tracks are kept together by a consistent style of their own which is always a good thing. It clearly shows that they have not just randomly worked through their ideas, but have put serious thought into their repertoire. Mellow vocals are giving their songs a specific taste, in a way similar to how Geddy Lee makes Rush easily recognisable. In fact, I kept trying to work out what band Gin Annie remind of, to no avail. Where I’d classify them is the “box” belonging to bands such as Magnum and Blue Oyster Cult. ‘100% Proof’ boasts good melodies, excellent instrumental work and masterful solos. The opening track is exactly what you would expect from a hard rock bank, with a symptomatic power drum intro that could do justice to bands of the sort of Whitesnake. One thing I am not convinced about are the melodies. They are no tunes to properly catch you, which makes the band not as mainstream as some of this genre’s representatives. This is not necessarily a bad thing, though; it simply means they may not get as much commercial attention as bands with catchy tunes and polished tracks. Gin Annie have produced some very good tracks, such as ‘Chains’ particularly standing out, featuring perfect guitar solos and background chorus. An example of another particularly good (if not a killer) intro is ‘Next 2 Me’. Tracks like ‘New Bad Habit’ give Gin Annie another dimension: towards alternative rock, with more aggressive instrumentals yet softened by the gentler vocals. This type of music is popular in the States with young names such as Devlistrip and Swirl rocking it. What I also like about this band is their overall image. I am a sucker for traditional hard rock bands, with musicians dressed in “that” particular way. 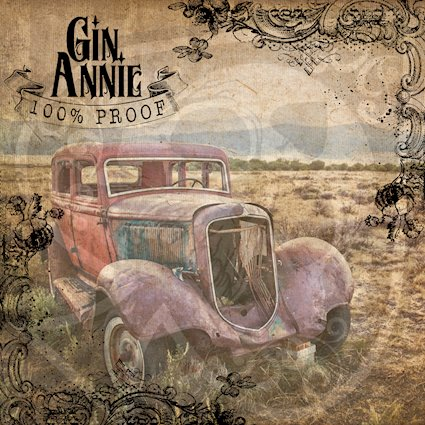 Gin Annie got the look of “real” rockers, which could be seen as shallow or non-original but certainly does it for me. Their music has the potential to sound good on stage, so I do hope the tour will take off and make them some fans. I suspect this may not the last we hear from this band and look forward to their next effort.